The Doctor- Custom The Clockwork soldiers were taken directly from The Mind Robber and were made of paper. The snake is from the Early Learning Centre. Originally shown December 2003, it has been reposted for December 2007. The original cover uses artwork by Alistair Pearson and is in the style of the Target re-releases of the early 90s. This one episode adventure is obviously inspired by season 6's The Mind Robber in which the Doctor, Jamie and Zoe find themselves in the Land of Fiction and face a number of surreal adventures. Another clear inspiration is that childhood Christmas staple- The Wizard of Oz in that the Doctor and his companions once taken into the Toymaker's realm temporarily lose their 1960s monochrome. The monochrome scenes were shot in colour and then the colour removed in Photoshop. At the time, the only previous 1960s story had been Land of the Dinosaurs, which was all shown in black and white. 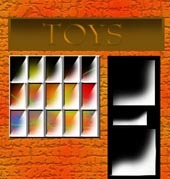 The scenes inside and outside the Toyshop used no sets. They were filmed on a blue background with the backdrop filled in after. The giant cards used were (obviously) an ordinary pack of playing cards. The story was shot in 2002 but not edited in time to make the Christmas spot for that year. Rather than have a Christmas story in the middle of the year, it was decided to hold it over for December 2003. The Toymaker's snowglobe was created entirely in photoshop during the editing process. 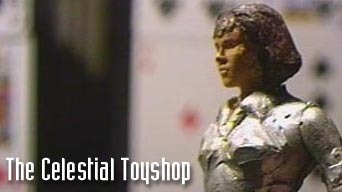 Similarly, the silhouttes of the Doctor and his companions as the Toyshop is destroyed were also painted digitally. The Toymaker's spherical monitor is a white polystyrene ball overlaid with an image from the story that uses the photoshop filter "spherise". The Celestial Toymaker first appeared in the story of the same name in 1965. He was supposed to reappear in a 1986 story The Nightmare Fair, this time battling the 6th Doctor but the story was never made. He has appeared in numerous books. 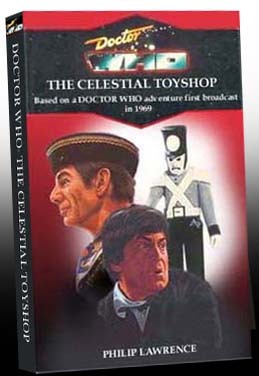 The title The Celestial Toyshop was used for a 2nd Doctor comic in the 1960s. The story is set in Season 6 due to the appearance of Zoe Herriot (The Wheel In Space- The War Games). The story takes place sometime after The Mind Robber since Jamie mentions the story. Jamie is also quick to name drop other monsters from the Troughton era- Ice Warriors and Yeti.